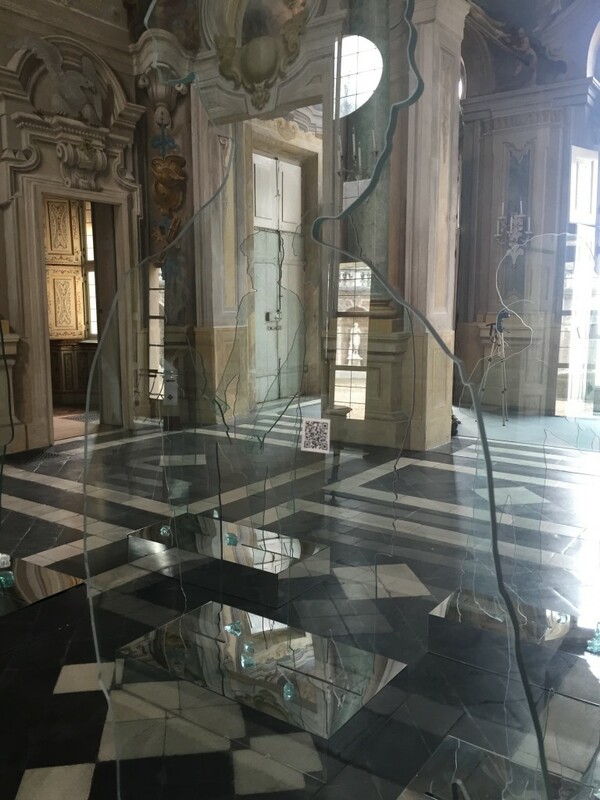 The Turin artist Raoul Gilioli presents his latest work “VITA, 200 stories through the glass” through different installations of public art as the social expression of solidarity and interaction between the public of art and technology. Raoul Gilioli has always expressed with his works the will to approach the public through social issues interacting with it through the use of reflecting glass-like materials with their strong addictive power and the use of technology to boost public participation providing for direct communication between artist and viewers beyond any “educated” mediation, in a perspective that broadens the scene and the public art. In “VITA, 200 stories through the glass” the multimedia and articulated interchangeability of the installations are intertwined to create a processuality typical of the art of our time. The open and interactive dimension is contingent and contextual to the expressive will of the artist that connects two different realities like that childhood and adult ones. The art establishes a physical and perceptive relationship between these two spheres and the “public” environment in which it acts redefining it. As stated in her paper of 1977 “Passages”, for Rosalind Krauss “public work becomes open practice of relationship with the world”. The making of the artist expands and, through the practice to build the environment by the public art, demonstrates his social vocation. Gilioli, in fact, operated on the territory moving “live” between the circumstances present in the intervention scene to give form and, above all, “life” to his work that moves away from the artistic practices purely oriented on the object to move towards a processuality that transforms communication in the true material of artistic practice. The same mediated use of technology produces remote actions that convey remote storytelling elements which enter simultaneously in reality connecting, then, remote persons in the present time. The work thus takes “life” continuously, actualizing itself whenever the QR code device is used. In this way the model of the monument comes in crisis: the installation, in fact, puts the viewer at the center of the work and becomes public interacting with him, being its distinguishing feature, but at the same time returns to be moneo, from the Latin word “monument”, that is “memory” of a narration of stories that intertwine and come into contact with the stander. With Gilioli sculpture is no longer “dead language” as described by the sculptor Arturo Martini in his eponymous of 1945 but becomes “spontaneous word among men”. Gilioli’s art can be defined public because is a work “al vivo” that is born from the dialogue between the artist and the public with whom it collaborates focusing on the relationship between audience and artwork. It’s from this trigger to public participation that the work acts as a public art by establishing a horizontal relationship of collaboration and sharing between the artist and the people who themselves become subject of the work. As an anthropological subjectivity, the artist enters the territory of the other, becomes the mean of others’ experiences and so his work thus becomes a metaphor of such relationship. The work, therefore, relates to social issues and cultural meanings that denote our civic life causing that art becomes public whenever it’s capable to indicate public issues. “VITA, 200 stories through the glass” is an artistic action that occurs in concrete social situations as a practice of inclusion through a project that wants to give support to the weak social subjects. The art, therefore, is not designed as a production of an object, but as a practice “al vivo” in the contexts of the territory and the city, addressing a wide audience as a social subject able to provide its direct contribution. The meaning of the art, hence, no longer derives only from an aesthetic quality of the work itself, but from the set of several exposure and reception factors; from the site context that activates specific states of reception which in turn activate a fruition work on the side of the receiver, who becomes the user and the receiver of that work being within a system of relations. The art theorist Rosalind Kraus defines the expanded field as “the expanded and widened body of the sculpture that emerges after it loses its finitude as a closed body with respect to the spatial and temporal circumstances in which it is located. From August Rodin sculpture is no longer a closed object away from the observer and it does not only requires the eye and vision as a tool at the center of the cognitive and experiential process but it does also the “time”, the real time of the sense experience that comes with making of the artwork and the experience shared with it”. Vita, 200 stories through the glass, 2014-2015. Villa della Regina, Torino. Courtesy dell’artista. Valeria Ceregini: “VITA, 200 stories through the glass” is an installative and documentary complex project since it consists of a preliminary phase of gathering materials, the live testimonials that you personally have collected in recent years since 2014 when the work started with the support of both the glass industry AGC Japan and Mediolanum Foundation. Given the magnitude of the video testimonials as you handled the preliminary work of data organizing? How do you stored them and how you then landed towards the conception and realization of the works themselves? Raoul Gilioli: The choice of the first part of the interviews fell on the valuable work of non-profit foundations and associations working in the suburbs in support of family fragility. They have helped us as a “bridge” to reach the respondents. The conception of the work and the consequent production had been planned a year before the interviews, looking for a multimedia expressive instrument able to document the testimonies collected and turn them into something highly aesthetic and exciting, the medium could only be the glass material that I always love. VC: “VITA, 200 stories through the glass” is a work ongoing in continuous growth and evolution finalized to founds collection that will be donated to the Fondazione Mission Bambini Onlus for the opening and maintenance of nurseries and play areas in the disadvantaged area of Italy. However this is not the only interactive aspect of the installation, there is in fact another type of involvement by the use of QR code for the reading of each work. What was the motivation that prompted you to insert such device? Raoul Gilioli: The QR code is a kind of key that opens the door of the world of images and sounds, the sights and the silences, the alive and pulsating subject of the stories told. So far there is no more effective tool for this transition. The installative work, in fact, has its infinity land on the web where to our work the public will add testimonies, in the sign of participatory. V.C. : It is not the first time that you make use of technological tools for the realization of your own work, it is the case of “You at Mirror” (2011), social installation able to meet with the public on issues that sometimes raises the misuse of social networking. In that case you had made use of mp3 audio tracks to get in touch with the user of the 17 silouhettes in silvered mirror. Where does your interest in this new technologies and especially their use in your creations take form? Raoul Gilioli: The technology has been for years in the service of art and vice versa, I am fascinated by the charm of innovative tools that return to art the role of ineffable magic that amazes and drags us like Alice in a fantasy world that is ourselves. Public art needs more than ever of such instruments, the public needs to find its art. QR codes, occupancy sensors, microphones, radio controlled movement mechanisms etc. are just an example. V.C. : The use of glassy or reflective materials and surfaces is what often distinguishes your work from “Pupil, through the looking glass” (2012) to “Cryogenic” (2013) but the leitmotif that unites all your installations beyond the use of “cold” materials is, above all, the social purpose. 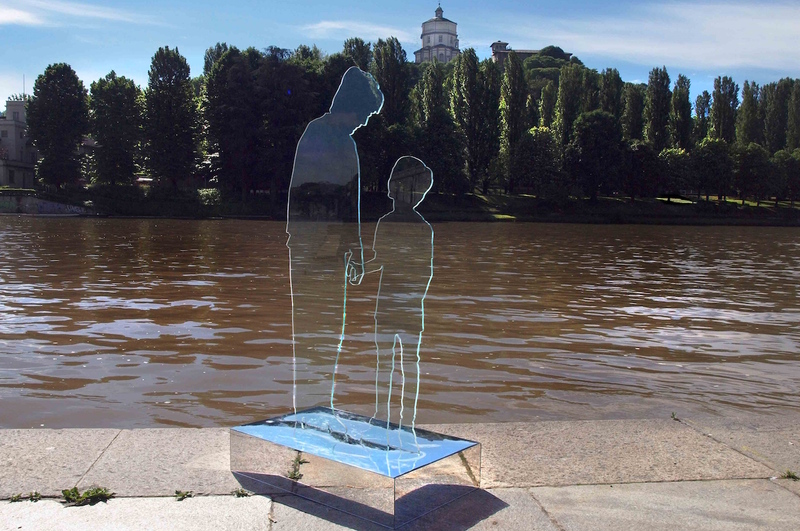 Through these public installations you are able to interact with the standers facing in front of the sculptures able to reflect and to seed reflections. In both cases, as in “VITA, 200 stories through the glass”, the medium, borrowing the affirmation of McLuhan, is the message? Since these materials are reflectors of the communication instrument, of the interaction with others, are they therefore the message, the vehicle with which you transmit your artistic and social message? Raoul Gilioli: For my research the social is mainly an opportunity and an occasion because I believe that we cannot forget to take care of all humanity. Art has among others, the task and the ability to support the social and in my small own I am happy to help with any project at this dynamic, but we must not be satisfied, humanity is suffering greatly today and there is need for dialogue, emotion, ideals, courage, respect. And so tools, materials, contents are used with the aim of making possible this participation, the glass in particular by its nature represents well the fragility and delicacy with which we have to relate with others in the various themes. V.C. : Again to quote McLuhan, the use of so-called “cold” materials involves a high participation of the public to which the “completion” is required? What does it mean for you as an artist and creator of public works featured by the strong interrelation impact? Raoul Gilioli: I like to think of the glass as a material that leads the public to make a choice from which also comes the heat or cold perception. On its surface you can reflect yourself, and in that case it will result as cold and aseptic, everything will remain inert or, conversely, looking through it will open the fire door with which it is made, penetrating the subject, going over to find the ancient warmth of responsibility and understanding. Cover Image: Vita, 200 stories through the glass, 2014-2015. Murazzi del Po, Torino. Courtesy dell’artista.